Being a DJ is usually not for the faint of heart or the light of wallet. It’s hard to DJ; if you’re a normal person like me, the art of mixing music tracks on the fly to change how they sound and blend them seamlessly appears arcane. Then there is the equipment involved. Fortunately, the barrier to entry is no longer so great. Computer software now makes it possible to DJ How to Mix Your Own Music Online and Be an Internet DJ How to Mix Your Own Music Online and Be an Internet DJ Read More without all the stuff and arguably with less of the skill. But there was still the problem of cost; or at least there was until recently. 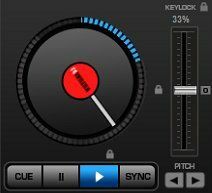 Virtual DJ, a great piece of software, now has a free version. Although getting to know Virtual DJ isn’t too difficult, it is still a bit overwhelming at first to figure out how to mix your own music, particularly if you’ve downloaded it simply because you want to make use of a few basic effects like blending and fading tracks or inserting some basic effects and loops. The interface is broken up into two sides, each of which has a full set of controls for whatever music is loaded. You can load music by dragging-and-dropping files from the browser in the lower half or by finding them in Windows Explorer and dragging-and-dropping from there. Once loaded, the name of the track and its length will be displayed, along with one other handy and important stat – BPM, or beats per minute. Once a song is loaded, you just need to press the play button under the virtual scratch table. One common reason for looking into software like Virtual DJ is the desire to blend tracks together as they play. 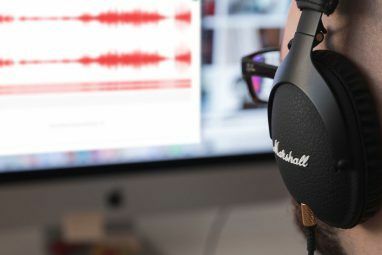 This basic improvement can be very handy if you’re playing songs at a party or you are playing songs as a background for a podcast or video podcast. While some music players Clementine - A Simple Cross Platform Alternative Music Player Clementine - A Simple Cross Platform Alternative Music Player Read More make an attempt to offer this feature, it doesn’t always work. Fading from one track to another is quite easy with Virtual DJ. 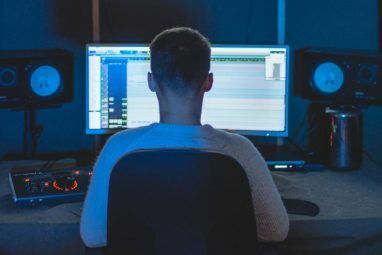 You just need to load two tracks and, once one is complete, use the crossfade tool in the center of the interface to move from one track to the other. Remember that the crossfade tool defaults at 50/50, so adjust it appropriately before playing the second song you have loaded. Also, remember the BPM stat I touched on earlier? 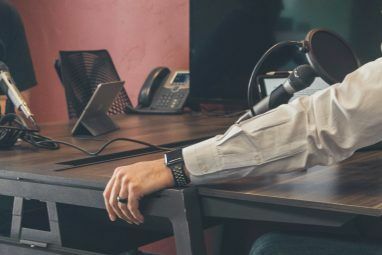 Taking a look at this will help you avoid a situation where a very slow track fades into a very fast one – often not optimal. Virtual DJ also has a sync Clementine - A Simple Cross Platform Alternative Music Player Clementine - A Simple Cross Platform Alternative Music Player Read More button, which will automatically put the beat of a loaded track in sync with the second track you currently have loaded. This will change the pitch of tracks, however, so use your best judgement. I thought fading tracks was quite easy, but what really surprised me about Virtual DJ was the ease of mixing tracks. There are a lot of tools available, and they’re not difficult to use. The main obstacle in your mixing will be your skill (I have none) rather than the interface. Creating loops, for example, is very easy. The loop tool in the lower left hand corner of a loaded track’s interface lets you automatically create loops of varying lengths, which can then be more subtly adjusted with the shift knob or locked down. Of course, this loop will continue playing for as long as you’d like, while the second loaded track will continue to play normally. Another handy feature are the hot cue buttons. There are three, and pressing one sets down a cue at the place you designated. You can then press the cue button again to automatically return to wherever you set the cue, making it easy to return to a portion of a song that you want to revisit. Fading and mixing tracks is really just a hint of what you can do with this software. It also includes a number of advanced features that real DJs will appreciate. For example, the virtual scratch table has a variety of settings and skills; I am simply, to be frank, unable to get much use out of it because I’m not an actual DJ. This is the only criticism that can be thrown at Virtual DJ. While powerful, the more advanced features can be intimidating. Virtual DJ Free is true to its name, but it does lack some features you’ll find in the paid version. The most important feature missing is support for hardware MIDI/HID mixers. The broadcast feature, which lets you share your DJing with others online, is also disabled in the free version. Virtual DJ Free is otherwise fully functional, however. If you have DJ skills, Virtual DJ has what you’ll need to keep a party entertained. Explore more about: Audio Editor, DJ Software. We believe that music obsession works as a surrogate for lack of human bonds. Music can pierce one's heart directly; it needs no mediation. Weekly Progressive House mixtapes uploaded every Wednesday. Listen to us out on MySpace!